It was April 2016, and Anderson Cooper was in the middle of a busy campaign season, covering debates and presidential primaries, when 60 Minutes producer Henry Schuster proposed doing an education story in Africa. Would he want to fly to Somaliland—a trip requiring an entire day of travel each way to report on an American-style boarding school? For Cooper, the presidential campaign could wait. His love of Africa is well-known among news producers who've worked with him. "He couldn't have been quicker to say 'Let's do it,'" Schuster tells 60 Minutes Overtime. "He was fascinated by going to Somaliland, where he'd never been, and doing a story that had a positive angle." Cooper and Schuster's Somaliland report, which airs this week on 60 Minutes, tells the story of the Abaarso School of Science and Technology. It's a boarding school that's home to around 200 of Somaliland's brightest students in grades 7 through 12. Founded by Jonathan Starr, a former hedge fund manager looking to give his life purpose, the school now sends students to the best universities in the U.S.
Twenty-five years ago, Somaliland split off from Somalia, which was plagued by famine and civil war. Though Somaliland today is faring better than its neighbor, it still isn't recognized as an independent country and remains one of the least developed places in the world. But that hasn't stopped the students at Abaarso from being accepted into universities like Yale, MIT, and Harvard. The curriculum at Abaarso is not much different from that of an American school—chemistry, geometry, trigonometry and contemporary world literature. Classes are taught in English, even though most students speak only Somali when they arrive. Immersed in English from the first day, most kids are fluent by the time they reach eleventh grade. "[Anderson] just loved talking to them," Schuster says. "He was more comfortable with these kids than just about any place." During a Q&A session with the students, excerpted in the video above, Cooper begins by telling them a bit about his life story. As he explains, around the time that Somaliland declared its independence, he was asserting his own freedom. He had graduated from Yale and was trying to break into the world of journalism-- with no luck. "I decided that if no one was going to give me a chance, I'd have to take a chance," Cooper says. "So I decided to start going to wars by myself to become a war correspondent." Cooper made a fake press pass and declared himself a journalist. Somalia, he tells the room of attentive students, was one of his first stops. He also gives them advice for becoming journalists, including the importance of getting an internship and becoming a good writer. But a journalist must do more than tell compelling stories, Cooper explains. "One of the roles of journalism is to confront people in power, to hold people in power accountable for what they say," Cooper says. One student asks if he has ever been threatened by an American politician, and Cooper answers that, while sometimes the challenge of holding a politician to their word can be intimidating, it's never threatening. "In the United States, journalism is protected in the Constitution, so it's a protected right," Cooper explains. "It's a protected freedom." Not so in Somalia, one student says, where it feels as though journalism has become a crime. What advice does Cooper have for youth who want to follow his path but fear retribution? "I don't know that I would have the courage to do what I do in a country that didn't protect journalists, in a country where I could very easily be killed or just disappear," Cooper says. "And I think it's very important. Change only happens when people are able to speak truth to power, when people who are in power are held accountable for what they do and what they say." The video above was produced by and edited by Will Croxton. While in Somaliland, Anderson did an interview with Somaliland National TV. His visit occurred in late April/early May of 2016. Anderson Cooper anchored AC360 from the NYC studio in the 8pmET hour. The 9pmET hour was anchored by Jake Tapper. Anderson and panel discussed Michael Flynn in the 8pmET hour, but failed to mention what Jake Tapper led with, President Obama's firing of Flynn in 2014. Guess that didn't fit the narrative AC360 was going after? An ex-hedge fund manager founded a high school in one of the poorest places in the world. Now Anderson Cooper reports from Africa on how students from Somaliland are achieving academic success. This Sunday, April 30 at 7 p.m. ET/PT. Anderson Cooper anchored AC360 in the 8pmET hour from the NYC studio. Jake Tapper has a prime time edition of The Lead in the 9pmET hour this week. Anderson was back on air in the 10pmET hour moderating a Town Hall with Governor John Kasich. Anderson Cooper anchored AC360 in the 8pm and 9pmET from the NYC studio. Anderson Cooper anchored AC360 in the 8pm and 9pmET hours. He closed the program with an interview he had done with The Rock Johnson about CNN's new series - Soundtracks. Anderson Cooper anchored AC360 from the NYC studio in the 8pm and 9pmET hours. The big news of the day was Fox News firing Bill O'Reilly. It pretty much validated the following video posted by Vox today : CNN's approach to covering politics prioritizes drama and spectacle over truth telling. AC360 seems to include at least one such segment each program. Anderson seems exasperated at times, but apparently Zucker produces every hour of CNN now. Sorry, we couldn't resist posting this photo! Jim Scuitto was in the AC360 anchor chair in the 8pm and 9pmET hours. Past and current attorneys of the New Orleans Public Defenders Office tell Anderson Cooper they believe innocent clients have gone to jail because they lacked the time and resources to defend them properly. The system is so overburdened that in 2016 New Orleans Chief Public Defender Derwyn Bunton began ordering his staff to refuse to take on clients facing the most serious felonies. Cooper’s report on the New Orleans justice system will be broadcast on 60 Minutes Sunday, April 16 at 7 p.m. ET/PT. All nine of the attorneys agreed when asked by Cooper if they believed an innocent client went to jail because they didn’t have enough time to spend on their case. Cooper follows one case of a man arrested in New Orleans who sat in jail for more than a year before an attorney presented evidence to the court showing he did not even match the suspect’s description. He also speaks to the man’s original public defender who got so fed up with not having the time to provide quality defense, she quit. At the time, Lindsay Samuel represented nearly a hundred clients facing a life in prison. She felt she was “Always coming up short. The first thousand clients you feel terrible. The second thousand clients, you feel awful,” she recalls. “Every day my clients are going away for a decade and I just move along to the next client,” says Samuel. A THR and National Research Group survey reveals 36 percent of respondents would describe Cooper as "improved" and "talented." 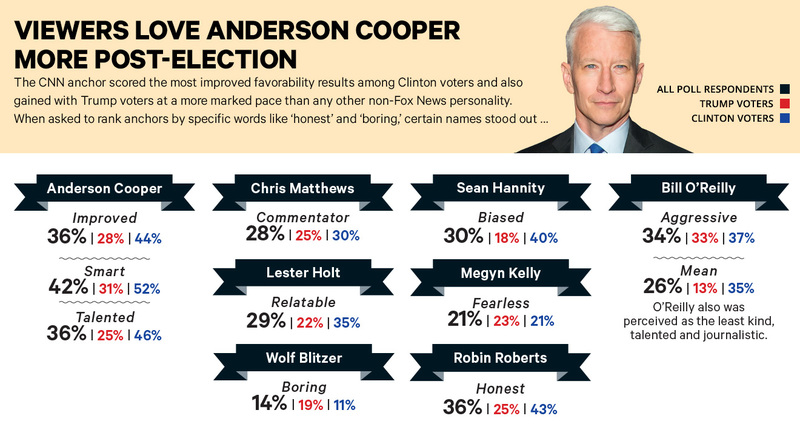 CNN anchor Anderson Cooper was the news personality viewed most favorably, according to a new poll commissioned by THR. The poll — which asked 1,000 news consumers (split 50-50 between Clinton and Trump supporters) to rank anchors by specific key words — found that Americans viewed Cooper as "improved" (36 percent), "smart" (42 percent) and "talented" (36 percent). Overall, 68 percent of respondents said they felt "favorable" toward him, higher than any of his colleagues. Other anchors were also ranked based on descriptive words such as "boring," "fearless" and "honest." Trump and Clinton supporters shared similar views of former Fox News anchor Megyn Kelly, who was targeted by Trump during much of the 2016 election cycle: 21 percent of voters described Kelly as "fearless" (23 percent of Republicans and 21 percent of Democrats). 29 percent found NBC Nightly News anchor Lester Holt to be "relatable," with 35 percent of Clinton supporters identifying him as such compared with 22 percent of Trump supporters. Trump and Clinton supporters' opinions diverged further when it came to ranking the accountability of Good Morning America anchor Robin Roberts and political commentator Sean Hannity. Overall 36 percent found Roberts to be "honest" — Clinton supporters had higher trust in Roberts with 43 percent, in contrast to 25 percent of Trump supporters. An average of 30 percent of respondents found Hannity to be "biased" — only 18 percent of Trump voters thought so, but a full 40 percent of Clinton voters did. 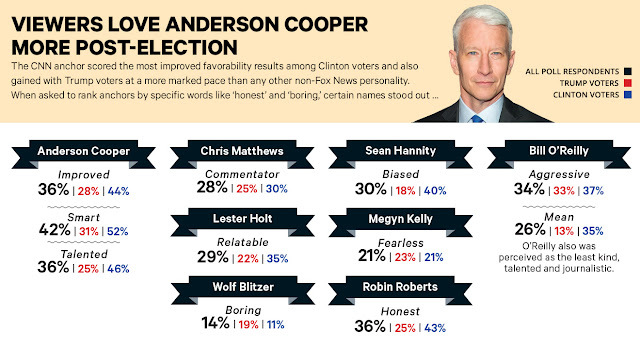 Also, 14 percent found Cooper's CNN colleague, Wolf Blitzer, "boring." Both political stripes had similar sentiments about talk show host and author Chris Matthews (28 percent of Americans described him as, blandly, a "commentator") and Fox News' Bill O’Reilly. Approximately 34 percent of combined Trump and Clinton voters found the host to be "aggressive," with Democrats viewing the anchor in a more negative light. 35 percent of Clinton supporters described O'Reilly as "mean" (compared to 13 percent of Trump supporters). The O'Reilly Factor host was also perceived as the least kind, talented and journalistic.